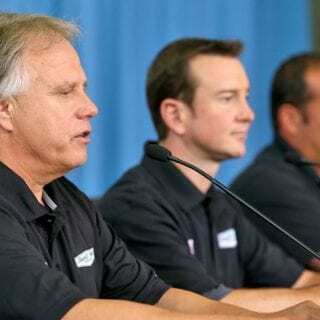 KANNAPOLIS, N.C. — Stewart-Haas Racing unveiled its new “Outlaw” of NASCAR, and his name is Gene Haas. The renegade nickname might belong to new driver Kurt Busch, who glossed himself with that anti-establishment moniker last year. But it currently seems best suited for Haas — the man who ensured through his own force of will that Busch will join Tony Stewart, Kevin Harvick and Danica Patrick in the most inherently dynamic and potentially combustible driver lineup in recent Sprint Cup history. Speculation over Busch’s move has prompted incessant hand-wringing over how the drivers possibly could coexist under one 140,000-square-foot roof. 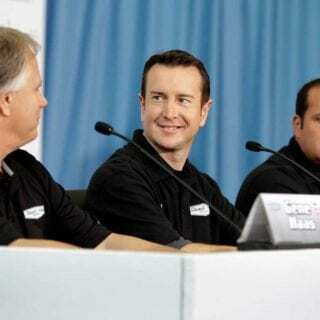 All of which became immaterial Tuesday after Gene Haas, the seemingly mild-mannered and overshadowed co-owner of SHR, stole the show in nonchalantly revealing how he overruled and angered Stewart in deciding the team — already trying to recover from expansion to a third car this season — would add a fourth car in 2014 funded out of the manufacturing tool magnate’s pocket. Never mind the players at SHR — how would its two principles get along after Haas pulled a power play on his NASCAR business partner/driver-owner to engineer the biggest free-agency coup of the season? Stewart, of course, hasn’t really had much of a say lately. He missed Tuesday’s announcement while still on the mend from the broken right leg he suffered in a sprint car crash three weeks ago. That happened to coincide with the courtship of Busch by Gene Haas, who learned a week earlier during a General Motors dinner at Indianapolis that the 2004 champion wasn’t under contract for next season. As Haas began preparing an offer to Busch, Stewart virtually was incapacitated. Gene Haas, whose Haas Automation has posted annual revenues estimated at approaching $1 billion, decided he would hire Busch with his company as primary sponsor — constituting roughly a blank check of at least $15 million-$20 million — without consulting Stewart and deal with the consequences when the oft-irascible three-time champion learned of it. 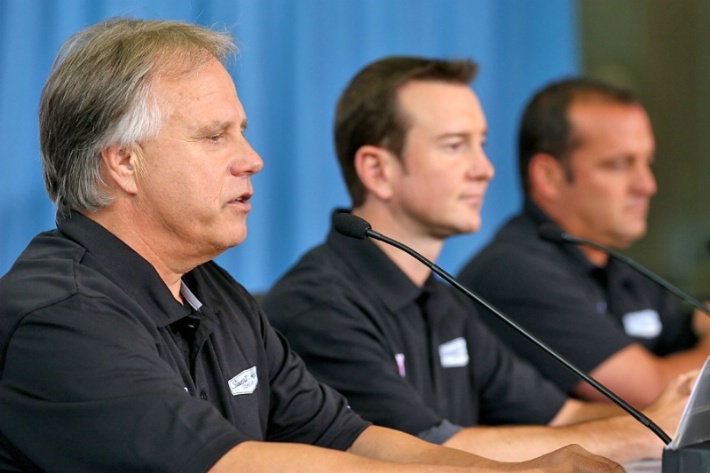 “So I kind of did this on my own, probably overstepped my authority a tick,” Gene Haas said. “I’m not used to having too many authorities to work with. I’ve been pretty much on my own. I did realize that Tony might be a little bit upset about it. He was. NASCAR is known for its share of surreal moments, but this bifurcation might qualify as the most bizarre episode of the 2013 season: Stewart, the quintessential racer who will be sidelined for at least four months because of his insatiable desire to drive anything, trying to convince Haas, the consummate businessman, into not letting his passion for checkered flags override a checking account and common sense. Haas said he and Stewart hadn’t endured many rifts and “we’re kind of pointed in the same direction … we’re using the money to accomplish something bigger than the money,” but it seemed reasonable to ponder whether Busch might engender lingering friction. There were many attempts Tuesday to defuse any such perception. 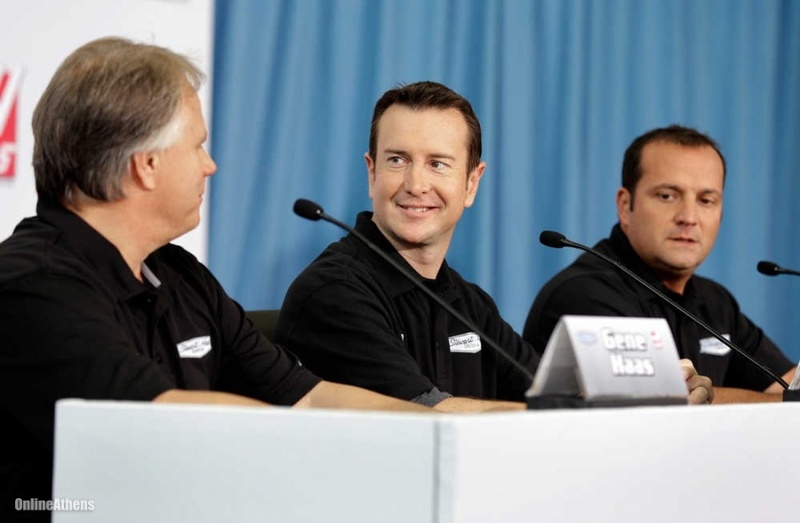 SHR director of competition Greg Zipadelli, the primary conduit for the recovering Stewart, said, “Tony was very much in favor of the fourth team. What Tony was against was us trying to get it done for next year. Still, SHR has become a NASCAR powerhouse almost solely because of Stewart. His magnetic charisma and sterling record brought scads of talented crew members and sponsors in tow when he arrived in 2009 after being given a 50% stake by Haas essentially in exchange for Stewart’s name and talent — immediately transforming an organization that had been an afterthought since its 2002 inception. The team won its first race in Stewart’s debut season, has made the Chase for the Sprint Cup every year since and won its first title in 2011. During the SHR’s climb, Stewart has emerged as such a major player as a driver, team owner and track promoter that it’s been easy to forget that he didn’t own the bankroll behind his Cup team. Tuesday brought a rather jarring reminder. “He has a lot of power,” Haas said. “I have to admit I have some power, too. In a sense it’s a check-and-balance system where the two powers balance each other out. I have a lot of respect for Tony. He’s a great driver, past champion. Tony has a lot of respect for me. I carry a lot of depth with my company. We have the ability. But if the team starts slowly in 2014 for the second consecutive season, the slew of questions suddenly won’t be aimed at the personalities behind the wheel. They’ll be focused at Gene Haas, who wasn’t sure how he might handle such a spotlight. While he seemed to relish the Busch announcement as his chance for an Alexander Haig-esque moment of declaring “I’m in charge” with the team’s primary leader out of commission, Haas isn’t accustomed to being the focus of media scrutiny like his partner. There is some sound business sense behind the Busch hiring. For the second straight season, the tempestuous star will be driving for a sponsor that owns his team — and that arrangement seemed to work well this season at Furniture Row Racing. Freed from many of the demands from third-party corporate sponsors that caused him headaches at Roush Fenway Racing and Penske Racing, Busch has seemed reinvigorated in carrying a single-car team to the brink of contention and a Chase for the Sprint Cup berth. Though he reiterated mea culpas that felt familiar from past attempts at image rehabilitation (“The opportunity is about people. 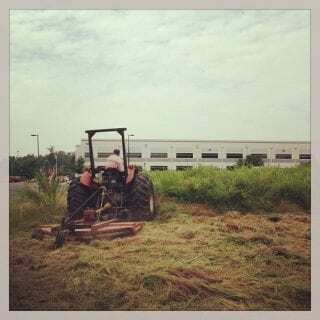 That’s what makes this so important that I’ve neglected in the past”), Busch truly has seemed more at peace this year. 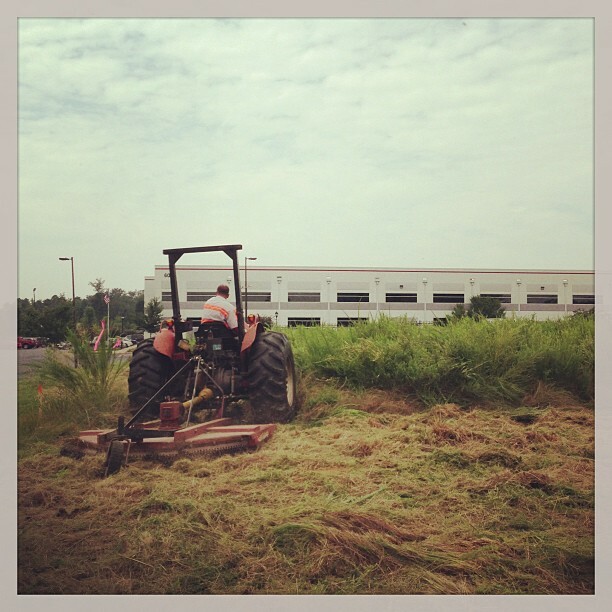 There will be many challenges ahead for SHR, though, starting with the expansion of its facilities. Gene Haas estimated it will take at least six to nine months to complete an extra building, and Zipadelli joked the first project is “a rubber room” for driver debriefings. Driver and crew chemistry is the secret to success in stock-car racing, and to that extent, Haas admittedly will be hoping for the best, too. 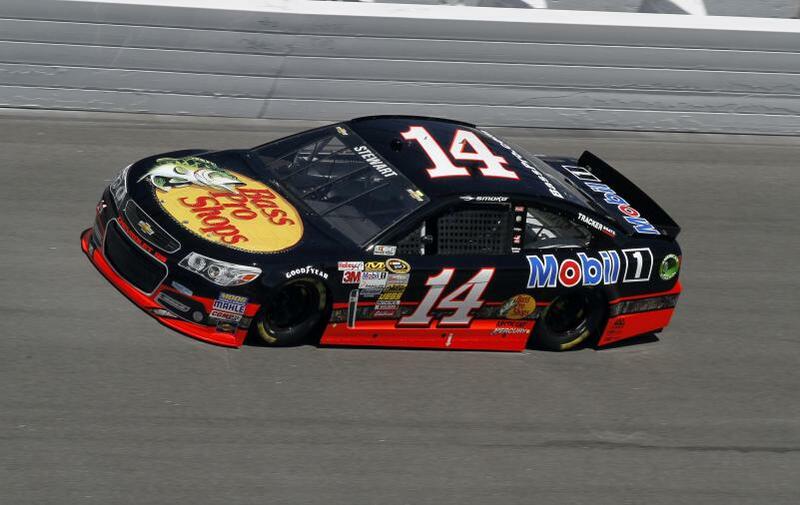 Even if it doesn’t, SHR will be the most fascinating Sprint Cup team to follow next season. A team that already had four compellingly stubborn spirits unexpectedly now has a fifth.